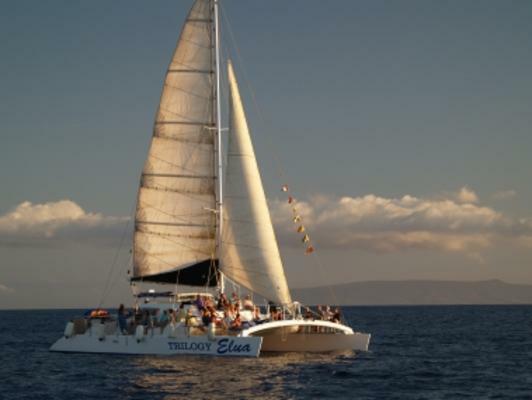 Take a Maui sunset sail aboard Trilogy’s safe and comfortable ocean sailing catamaran. 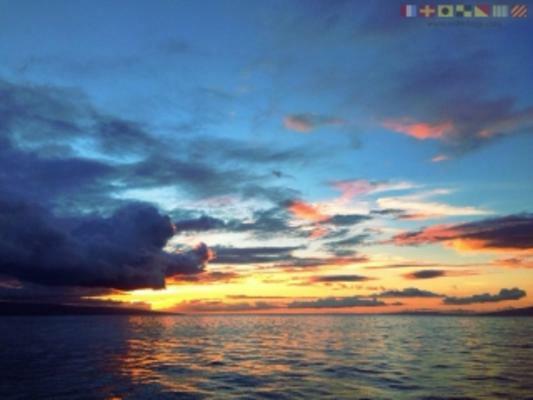 Our sunset cruise provides the most romantic way to experience the beauty of a Maui sunset. Our chefs prepare an assortment of hot and cold appetizers (view menu below) that are guaranteed to satisfy the most discriminating gourmet. For guests ages 21 years and up, enjoy three complimentary premium beverages on the return sail! Bar Includes Moloka‘i Mule, Lana‘i Tai, Maui Brew Co.’s seasonal beer, Longboard Lager, Chardonnay, & Rosé. If using a GPS, please enter this address: Ka‘anapali Beach Hotel 2525 Ka‘anapali Pkwy. Lahaina, HI 96761 Parking is available in hotel’s parking structure. A crew member will validate your parking ticket. Check-in is 30 minutes prior to departure time at the Beach Lawn fronting Ka‘anapali Beach Hotel. 3:45 pm (winter season) or 4:45 pm (summer season) at the Trilogy Concierge Services beach desk fronting Ka’anapali Beach Hotel. Look for your Trilogy crew member wearing a blue Trilogy shirt. PLEASE NOTE – You will be loading directly from the beach, through the water, onto the boat and you will get wet. Wear your swimsuit (with a cover-up) and please place your cell phone and camera in a dry bag. The two tour times below reflect 4:00 pm departure (winter) or 5:00 pm departure (summer) departure. Your confirmation email will confirm the check-in time. 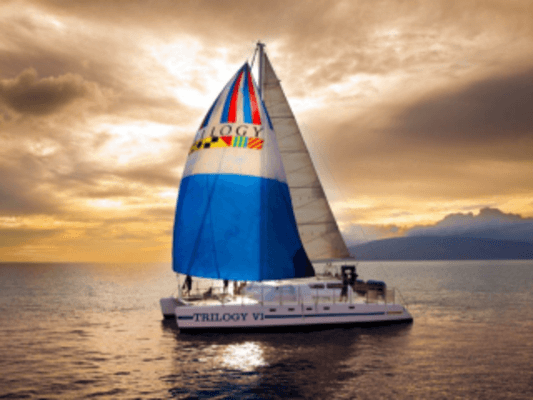 Trilogy’s crew will serve an assortment of hot and cold appetizers throughout the trip as well as a variety of soft drinks and filtered water. Adult beverages provided throughout the sail. For Vegetarian guests, the Chicken and Pork options can be replaced with Grilled Vegetable Kabobs with a least 24-hours advanced notice. PREMIUM BAR: Moloka‘i Mule, Lana‘i Tai, Maui Brew Co.’s Bikini Blonde Lager, Kona Brewing Co.’s Big Wave Golden Ale, Prosecco, Sauvignon Blanc, & Pinot Noir. Itinerary confirmation will have the exact time to board. Boarding time will vary depending winter or summer season. 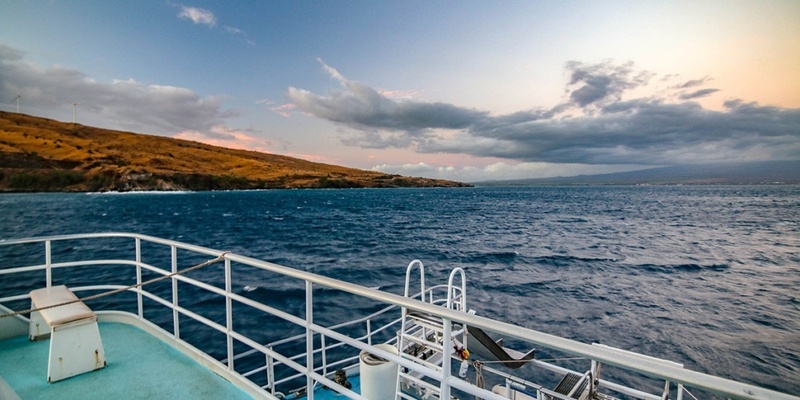 With breathtaking views of Moloka‘i and Lana‘i, spinner dolphins and flying fish, this two-hour Maui sunset sail is relaxing, delicious, and fun for the whole family! 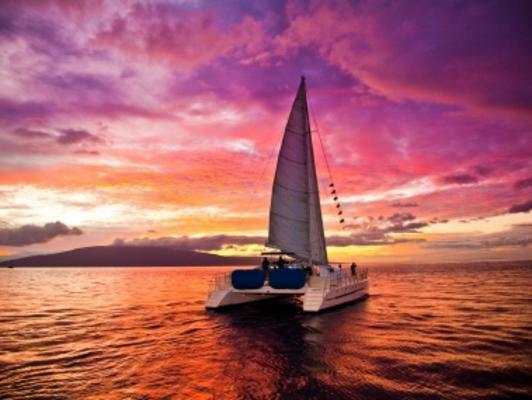 So, join Maui’s oldest and most experienced sailing company for a personalized deluxe sunset sail that loads directly from world famous Ka‘anapali Beach. To start the day you’ll be served a continental breakfast of fresh fruit & cinnamon rolls. 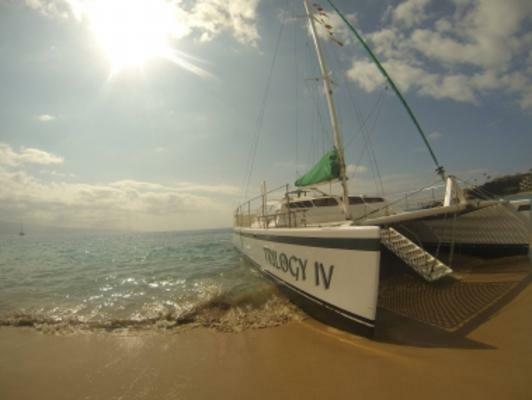 For lunch, enjoy Trilogy’s famous BBQ lunch, A snack of Chips and Salsa during snorkeling. Drinks include Non-alcoholic beverages and chilled filtered water. What snorkel locations will we visit?